I finally got around to playing Assassin’s Creed: Syndicate recently, and I’m pretty sure it’s my favourite entry in the franchise. Yes, that’s including AC: II and Black Flag - I’m talking favourite, here, not most revelatory. 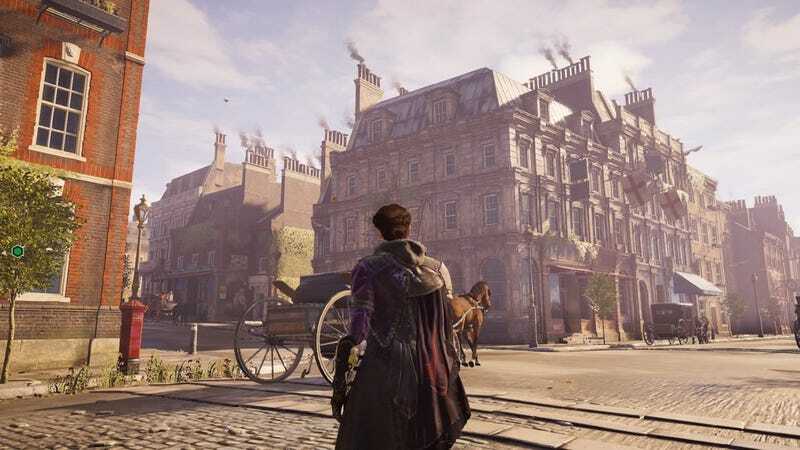 Beyond the mechanical improvements to the parkour, the side missions that are actually compelling, and the refreshing repartee of the brother/sister protagonists, there is one aspect of Syndicate that resonated particularly deeply with me: Ye Ol’ London. My grandparents are British. My mum was born in Lebanon, raised in England, then moved to Australia in her early childhood. Consequently, I’ve been surrounded by British influences all my life, from the stories of my grandpa working as an RAF engineer in the wake of WWII, to the days spent wandering the dirt paths of Sovereign Hill - a Gold-Rush-era historical park where my grandparents do volunteer work. I’ve watched more BBC and CH4 than any local TV, and I probably know more about British history than I do Australian. So, from my first steps on the cobblestone streets of Victorian-era London, I felt right at home. Top hats, waistcoats, walking canes, hoop skirts: these were all familiar items I’d seen my grandparents wear countless times. Horse-drawn carriages spurred on with cracking reins and cries of “Woah, girl!”: I could almost smell the earthy (and sometimes pungent) aroma of the carriages I’d ridden on many moons ago. And the posters! Proclamations of the power of steam, invitations to try out the new Omnibus service, advertisements for Abbot’s Cocoa Powder: I have a fake Wanted poster with my name on it made out in the very same style. Old-timey ads are so much more appealing than modern ones. The Assassin’s Creed games have always touted the historical authenticity of their settings (less so their plots), but Syndicate is the first game where that has truly meant something to me. I spent hours wandering the streets of London, not just because they were mighty dapper, but because they evoked so strongly my British upbringing. It felt less like escapism and more like reliving my youth. Have you experienced anything like this before? I know a lot of people have been keen on The Division’s New York setting, but are there any other games that have struck a chord with you thanks to their familiar locale? Or the opposite, maybe: have any games butchered their setting so badly that you were actively turned off?